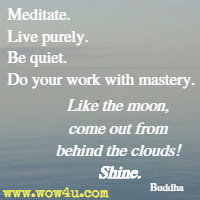 The teachings of Buddha have been passed down from century to century. 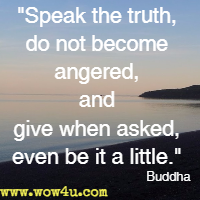 Buddha was an Indian leader, many say a holy leader, who taught those who chose to listen and to believe. By three things the wise person may be known. What three? He sees a shortcoming as it is. When he sees it, he tries to correct it. And when another acknowledges a shortcoming, the wise one forgives it as he should. 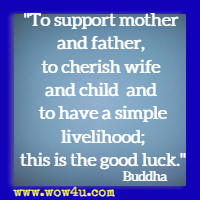 To support mother and father, to cherish wife and child and to have a simple livelihood; this is the good luck. We must be diligent today. To wait until tomorrow is too late. 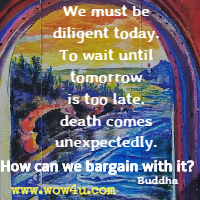 death comes unexpectedly. How can we bargain with it?